Our line of Programmable DC Power Supplies covers power levels from 5kW to 480kW and voltages up to 1500Vdc. Available in Source only version (DCS Series) or with Source and Sink capabilities (DCB Series), our DC power supplies offer higher power density and high performance in a 3U high, 19″ rack mount form factor. What sets the DCS Series apart is it ability to support both high output voltage and high output current using constant power voltage/current range technology. Contrary to conventional programmable DC power supplies that deliver max. output power only at one operating point, the DCS series supports full output power over a much wider range of settings. This allows the same model DCS to be used for a much wider range of applications. The DCB Series is a two-quadrant, bi-directional DC Supply and DC Load combination using highly efficient regenerative energy recovery to the grid when in current sink mode. Seamless and fast transitions between source and sink mode and back are assured. Perfect for development and charge/discharge testing of battery packs. The DCS Series programmable DC power supplies provide clean DC power output in a compact 3U rack mount chassis. These cost effective power supplies units offer excellent performance and ease of use. Available power levels are 5kW, 10kW or 15kW per chassis. Voltage ranges start at 30Vdc and top out at 1500Vdc. The DCB Series programmable DC power supply/load combination units support two quadrant (source or sink) capability in a compact 3U rack mount chassis. These cost effective power supplies or supply/load units offer excellent performance and ease of use. 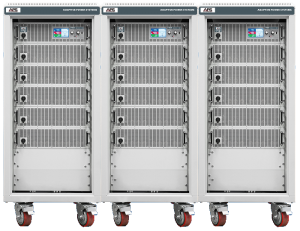 Available power levels are 5kW, 10kW or 15kW per chassis. Voltage ranges start at 30Vdc and top out at 1500Vdc. For DC power test applications higher than 15kW, two or more DCS or DCB Series DC power supplies can easily be paralleled to create higher power configurations. Up to 32 units can be paralleled to cover requirements to 480kW. Users can install in their own 19″ rack or order pre-installed and wired, ready to use DCS or DCB Cabinet systems.